Iceland Air is a great way to fly to Europe, not just because it’s pricing is awesome but because its flights all have a stopover in Iceland. Why is that great? Because you can stay there for up to a week at no extra cost to your flight. Iceland’s Blue Lagoon in January. Even a two-night stop gave us time to bus to the fabulous Blue Lagoon miles out across the lava fields and stay in the poshly eerie Blue Lagoon Hotel & Geothermal Spa. At night and the following morning we walked the lava-gravel paths through the lava fields to the Blue Lagoon, where you can wander slowly shoulder-deep through the steam, past the fumarole gushing boiling water and surrounded by a railing to keep tourists from getting spattered, into the cave of cool waterfalls, paint your face with the white granular mud, or belly up to the water bar. Stuffing our pockets with fruit from the complimentary breakfast, we bused to the City Center Hotel (ask at the front desk for them to call Daggur, if you want a historic walking tour) in old Reykjavik for an afternoon and evening and morning of sight-seeing and shopping before catching the next plane out. Of course, with a full-day ( two-night) visit, you can do the “Golden Circle” day tour of “Iceland’s most stunning sights” and plenty of other cool stuff. One day off the plane is enough to make you realize how much you could do and see in a week. On other airlines, Iceland would boost your air costs, but Iceland has discovered a wonderful way to make travelers want to get off the plane in Iceland and pump the tourist economy. One sight I wanted to see but didn’t schedule it because I didn’t think it would be available in the dead of winter, was the volcano tour where you go down inside it in hot caves and crevices. But it was available. The “dead of winter” in this island surrounded by ocean does not mean snow. It does snow, but the snow doesn’t set in and stay. We did this in January 2014, and yes, January is a beautiful time to visit Iceland. One has to appreciate a bit of gothic atmosphere, though. Neck deep in the Blue Lagoon at dawn (which happens in late morning in the winter; at 10 a.m., the night was still black but the sky was a canopy of pale blue light), we watched the progress of the sun from below the horizon, to across the horizon (but still below its low line of clouds), and realized we would never see it that day. The lava fields around us were strong but muted colors, like the color photography in a 1950 National Geographic; dark red lava fuzzed over with dark green moss, kaleidoscopic knobs and heaps separated by crevices and stretching away into the distance. Mid-winter is when the Northern Lights are the biggest attraction — they even have Northern Lights tours that go out on buses at night to viewpoints in the countryside, although we walked out to view them on the back patio of our Blue Lagoon hotel room. At the edge of the patio, the lava fields bulged chest-high here to overhead-high there, jumbling away into the distance looking to the right, and looking to the left, away to the first turquoise channels and ponds before the churning steam cloud above the Blue Lagoon. 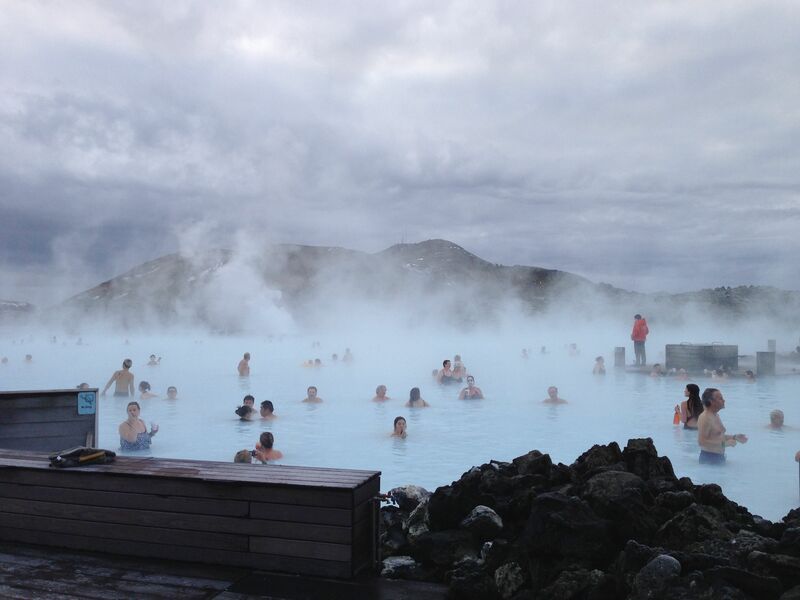 Do the Blue Lagoon, and the Blue Lagoon Hotel & Geothermal Spa sound posh? It’s not, at least in January, when it compares with a hotel in old Reykjavik. Most tourists don’t appreciate the attraction of Iceland this time of year, but Iceland shows its appreciation of those who do. On the really vast (for an island) landscape, the population is only about 320,000. The Icelandic they speak is old Norse, from the time they set up shop here more than a thousand years ago, and even the Norwegians can’t understand it. A language spoken by only 320,000 people on the planet.